As we continue our look at the muscles of the arm we will next look at some of the muscle found in the forearm. One of the first things you may notice is that there a many more muscles in the forearm than the upper arm. This makes sense once we understand how we move the fingers and hand. Though there are some muscles in the forearm that move the arm, many of the muscles located there move the fingers and thumb or the hand at the wrist. Since there are several muscles to discuss I thought I would break them into groups based on their actions. Today, we will look at a group of the muscles found in the forearm that flex the hand and fingers. We will look at where these muscles attach to the skeleton and describe how these muscles move the arm. The muscles on the limbs generally move the bones below where the muscle is located. 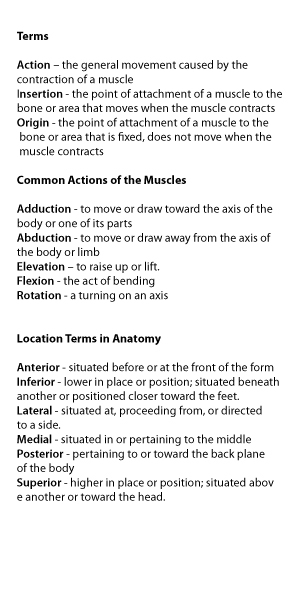 For example, the deltoids move the arm at the humerus and the biceps brachii move the radius and ulna. This is true of most of the muscles on the forearm as, when engaged, these muscle pull on the bones of the hand. Some muscles flex the fingers, some extend the fingers, and others bend the hand at the wrist. They all work together to allow the hand to move and grip. Focusing on one group at a time we will look at the flexor muscles. These are the muscles that flex the fingers and hand, bringing the fingers in towards the palm or the hand closer to the arm. The flexor carpi radialis is one of the muscles involved in moving the wrist. This one bends the arm at the wrist and pulls the hand away from the body. The flexor carpi radialis starts at the bottom of the humerus on the inside of the arm and ends at the bones in the hand called the metacarpals. Another muscle that bends the wrist is the flexor carpi ulnaris. This is responsible for bending the arm at the wrist and pulling the hand in towards the body. The flexor carpi ulnaris also starts at the bottom of the humerus on the inside of the arm but ends at a bone in the palm of the hand called the pisiform. This muscle moves the fingers. When engaged the flexor digitorum superficialis draws the fingers in towards the palm of the hand. The flexor digitorum superficialis connects to the humerus, radius, and ulna at one end and runs down the interior of the arm. At the other end it connects to the end of the fingers. Yet another muscle that spans from the elbow to the wrist, the palmaris longus also bends the arm at the wrist. It pulls the hand in towards the arm. The palmaris longus starts a the same location as many of other flexor muscles found in the forearm. This is because it is attached to the same tendon as those muscles. At the other end, the muscle attaches to a fibrous sheet of tissue that connects the muscle to tendons found in the hand. This one works much like the flexor digitorum superficialis except this muscle moves the thumb. When engaged the flexor pollicis longus pulls the thumb in towards the palm of the hand. The flexor pollicis longus begins at the middle of the shaft of the radius and the adjacent membrane of tissue. 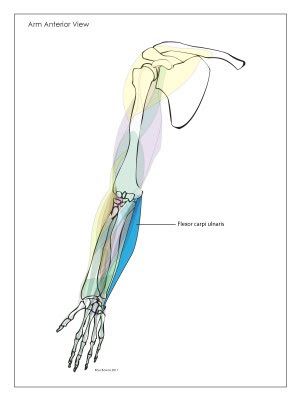 It moves its way down the forearm and connects itself to the bone at the end of the thumb. Origin: The middle of the radius. The flexor digitorum profundus is one more muscle that moves the wrist. The wrist can move in several directions, allowing us to perform complex tasks. This requires several muscles to perform each movement. This muscle also bends the arm at the wrist in towards the arm. The origin of this one is at the top of the ulna and the surrounding tissue. Down at the other end of the muscle the insertion attachment point is at the far end of the fingers. 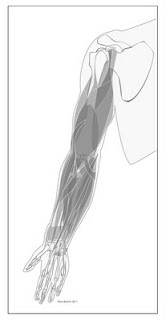 Unlike other flexor muscles we have reviewed, this muscle moves the arm a the elbow. The brachoioradialis is a larger muscle that pulls the forearm in towards the upper arm. This one works with the bicep brachii in many movements. The brachioradialis starts at the body of the humerus just above the base and attaches itself to the far end of the radius. Something that might help you get a better sense of what these muscles do and where they are located is to hold onto the upper part of the forearm then move your fingers and hand around. You will feel the muscles engaging in the arm. Here are some more video flash cards to practice with.